Daniel Ellsberg was an anonymous military analyst working for a conservative think tank until 1971, when he ignited a national firestorm by releasing the Pentagon Papers, a top-secret expose of government decision-making about the Vietnam War. The epic document, detailing some 22 years worth of sensitive information, established a precedent for conscientious whistleblowers that resounds today, in the form of Pfc. Bradley Manning, Julian Assange and the WikiLeaks controversy. 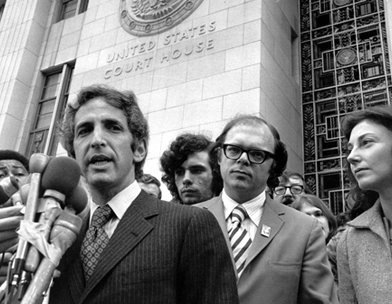 Ellsberg, who will turn 80 in April, remains as politically active and engaged as ever, his popularity renewed by the 2009 Oscar-nominated documentary The Most Dangerous Man in America: Daniel Ellsberg and the Pentagon Papers. In commemoration of the 40th anniversary of the Pentagon Papers’ release, Florida Atlantic University will host Ellsberg for a lecture at 3 p.m. Wednesday, Feb. 16, at the Kaye Auditorium on the Boca Raton campus. Admission is $12. Thomason: How’s your afternoon going? 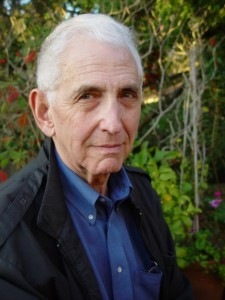 Ellsberg: The afternoon is OK. I just finished an interview with a Swedish television program for next week on WikiLeaks and what’s happening in the Middle East. Thomason: Yes, you’ve been in demand a lot lately. Ellsberg: Well, because of WikiLeaks, the analogy to the Pentagon Papers period is so strong that it’s mentioned all the time, so people have been turning to me in a way they haven’t for quite a while. Thomason: Do you find it’s an accurate comparison? Ellsberg: Yes, I think basically so. It’s inevitable. Of course, there’s major differences, but there are fundamental similarities. It’s the first large-scale release of classified information from inside the government by an official whistleblower since the Pentagon Papers 40 years ago. There really hasn’t been anything like it in between. So the comparison is inevitable, even though the content of what’s released has some significant differences. The Pentagon Papers were top-secret, very sensitive, high-level decision-making papers by the Joint Chiefs and the top officials of the government on policy-making; these are field-level reports, largely, or in the case of the State Department cables, relatively low-level secret, rather than top secret, documents, so they don’t reveal as much about decision-making as the Pentagon Papers did. On the other hand, the current ones have the advantage of being, well, more current than the Pentagon Papers were. The most recent of those were at least three years old, and in this case, the documents go right up to last year, which means the new Obama Administration. And one of the secrets, you might say, that’s revealed in these papers, is the same as in the Pentagon Papers, and that is how great a degree of continuity there is in policy, even between administrations that claim to be very different. There’s not a lot of difference in what we can read in the State Department cables of 2009 from 2008, and the policies and general approach seem very similar, including the persistence of practices of torture and a failure on our part to do anything to resist that. After all, this is an administration that promised to end torture, and we have not done that, as was made clear in the cables. We’re turning prisoners or suspects over to Iraqis knowing that they’ll be tortured, and that’s as illegal under both international and domestic law as if we were torturing them ourselves. Thomason: Would you support a 2012 primary challenge from the left against the Obama Administration, by a candidate who might stand up for these issues? Ellsberg: Yes. That’s the first time I’ve been asked that, by the way. That’s interesting; what prompted you to bring that up? Thomason: It’s been on my mind lately. I just don’t know if it’s very viable. It seems like something that might be more symbolic. Ellsberg: If we had a plausible candidate at all – we’re talking about a very expensive effort here, a big-scale effort and one that isn’t worth doing without some candidate that would get attention – I could indeed support such an effort, even though I think the chance of it succeeding and actually giving us a new candidate is close to zero. So the question would be, is it worth doing without any real prospect of actually changing the candidacy? I think it might be and might not be. It would depend on circumstances that develop over the next year. But I can’t imagine it couldn’t be worth doing in order to establish the point that what President Obama is pursuing any many respects in Afghanistan and Iraq is just intolerable. It’s intolerably costly and risky, especially in terms of his policy in Pakistan – a covert war in Pakistan is an extremely risky policy. And we have no justification for the killing we’re doing in Afghanistan. It has no prospect of achieving any legitimate interests or benefits for us, and it’s costing $100 billion a year or more that we obviously cannot afford, and it’s being taken out of programs that we do need. So it’s a disastrous policy. Now, there’s no question in my mind that what the Republicans offer now and I’m sure two years from now is significantly worse, so I would have no interest at all in some kind of third-party run that would increase the chances of a Republican victory. And I would oppose that just as I felt that Nader’s campaign in 2000 was run in a way that was very costly to our country, that it helped give us eight years of [George W.] Bush, and I certainly would not want to be a part of that. But in terms of a strong, principled statement of opposition to the policies Obama is actually pursuing, I would want to be part of that, and I am part of that. Thomason: Half the country, it seems, already seems to think Obama is headed toward some kind of European socialism. So I’d hate to know what they thought of a really left-wing candidate. Ellsberg: Well, that’s simply absurd. Remember, after all, that most of the country believed, I’m sorry to say, that Saddam Hussein was behind 9-11 and was tied in with Al Qaida. In fact, a very large fraction believes that today. Well, I would put it to a member to the press, yourself let’s say, do you feel any responsibility for this? Not that you’re responsible for it directly, I’m sure, but being part of a profession that has failed so badly, this institution to educate the American people of simple realities? In other words, with all our free press, which is, for a large nation, one of the freest in the world, how can the public be entirely misled? How about the belief in WMD in Iraq and so forth? The government’s ability to fool the people is quite spectacular. Lincoln said, “You can’t fool all the people all the time.” Well, you don’t need to. You just need to fool enough of the people enough of the time. And our government and other interests in our country, such as corporations, seem to have that pretty well in hand. Thomason: It seems to be a combination of deliberate misinformation campaigns and people who, no matter how many times they hear the truth, they just don’t believe it – like the birthers, for instance. Ellsberg: Right, well, they are a minority, but this point that you mention regarding Obama as a leftist is just bizarre. But these days, a lot of Republicans believe that. I mention that not just because it’s wrong but because it’s so extremely wrong as to be almost laughable. Merely by saying it, they can get a lot of people to believe it. Thomason: Whom did you initially support in 2008? Ellsberg: It was more or less symbolic, but I agreed with [U.S. Rep. Dennis] Kucinich’s platform in the primaries, and I stuck with him to help him get a voice for his proposals. I thought his positions were very good. But then, once the nomination was made, I certainly supported Obama. And as I said, I would again, with all my reservations about him, in opposition to his opponent. I don’t expect my talks in Florida to focus on domestic politics; they never have throughout my career, and I don’t purport to be any kind of authority or leader on such matters. If people ask me, I answer the questions, but this isn’t the subject of the lectures. Thomason: What is this upcoming lecture appearance about? Ellsberg: I’m asked to talk about the implications of secrecy in our society, and WikiLeaks, and the analogies to the Pentagon Papers, and my attitude toward whistleblowing, which is something I do want to encourage. I think we have too little of it, not too much, and that the extreme mess we’re in, in the wars in the Middle East and also matters like climate and the economy, do not reflect too much truth-telling or leaking, and too little secrecy, but quite the contrary. Even the bank meltdown is an example of something where insiders telling the truth about deception within their own organizations and illegality by their organizations could have prevented much of the catastrophe that overtook us. And that’s also true on climate, where several administrations collaborated, one after the other, in denying the import of climate warnings we were getting. I do think that for people on the inside to reveal that the knowledge of these matters are known inside and that the public denials are consciously false is a very useful activity, even when it has great personal costs. Part of my message, why I’m trying to encourage such whistleblowing, is that it’s not guaranteed to help at all, and that it usually carries very heavy personal costs, in the corporate world or in the government. And whether it results in prosecution or not, the effects on careers are very great. Thomason: Your life was famously threatened in the years following the release of the Pentagon Papers. In some ways, the threats resemble plots from Mafia movies. Do you still feel threatened today? Ellsberg: Interesting question … I think that surveillance today is enormously greater than it was in those days, whereas it took a White House operation to institute a lot of illegal surveillance on me at that time, including a burglary of my former psychoanalyst’s office. That was then a covert operation, and when it was exposed, it threatened Nixon with prosecution or impeachment, and he had to resign. Now, such burglaries of my private information, let’s say, are regarded as legal under the Patriot Act. The use of CIA against me would now be legal. And even — you talk about Mafia movies — but the effort made to “incapacitate me” by Bay of Pigs veterans working for the CIA, was a covert operation, clearly illegal. Nowadays the president makes no secret of the fact that he has put American citizens like Anwar Al-Awlaki on a hit list of assassination abroad, and that could happen in this country, too. So I would say the risks for everyone who is dissenting or protesting or criticizing or exposing are greater, and that includes risks of illegal action. So to answer your question directly, I would now put it much higher than I am under more surveillance simply as a supporter of WikiLeaks than I was 30 or 40 years ago, and even more than I would have been a few years ago. I’ve been a protester of U.S. policies for a long time, but I didn’t think that the government would regard me as important enough to be surveilling my telephone calls and e-mail and what-not. And when I say surveillance I don’t mean real-time, in that someone is listening at every moment, but that everything is being recorded. I don’t think you have to be important anymore to get that. I think the NSA routinely records a vast amount of internal communication, and I expect to be included in that. So, since you’ve asked, I would assume this very call is being recorded. Thomason: I appreciate that you’ll be giving this talk at a college, because it doesn’t seem like college campuses are ground zero for activism like they were when you released the Pentagon Papers. Do you feel like my generation could use a lesson on how it’s done? Ellsberg: Tell me what your generation is … how old are you? Thomason: I’m 28. I went to school when the war in Iraq was at its bloodiest, and it seems my generation fit the cliché of caring more about American Idol than their country engaging in an unjust war. Ellsberg: Yeah, well, it seems to be true of the older people as well, when you come down to it. It isn’t just that the youth are less interested than their parents. It’s just that nobody is. The difference in the ‘60s and ‘70s is that there was a youth movement. It wasn’t a general population movement of dissent. It was youth. And we haven’t seen that for a long time now. I’m not entirely clear why; maybe you know better. I think it’s partly economic differences. People are more concerned with finishing education and getting ahead. But I don’t know why we haven’t seen that. Interestingly, in what we’re seeing now in Tunisia and Egypt seems to be youth rising up in a way that they haven’t seen there for a generation, and that does reflect the Internet, which didn’t exist before. Our young people now are much more involved in the Internet than their elders, and conceivably that will make some difference here, though it hasn’t yet. Thomason: You’ve mentioned Iraq and Afghanistan probably more times in our conversation than I’ve heard on the news in months. 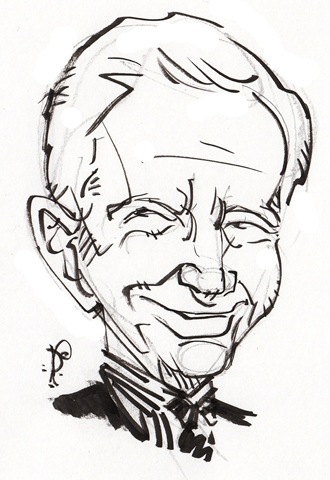 Ellsberg: Ha-ha. Well, of course WikiLeaks brought both of those in the news for a while at least, so I contradict you there in the sense that the Afghan war logs were released and then the Iraq war logs were released; that was a flurry, and it was in the last few months. But you’re right: We’re acting as if there’s no war going on in Iraq, which there is. It’s not totally peaceful there. And of course in Afghanistan, the war is getting bigger thanks to our involvement. American casualties just aren’t at the level to attract much attention. For the Afghans, the war is disastrous, but for America it’s a huge money cost, the acceptance of that is rather striking. Why is there this degree of acceptance? It seems the only people are [U.S. Rep.] Ron Paul and [U.S. Sen.] Rand Paul, of all people, who are pointing to the costs of those wars as something we shouldn’t accept. But that might change. Here’s a case where at least part of the Tea Party may actually target the military budget and the wars – that may be a change that we didn’t see under the Democrats. Thomason: You were arrested in Washington recently, in December, for protesting these wars. I thought that would have been news, but I only heard about it when listening to a far-left radio show, The Mike Malloy Show. Ellsberg: Actually, on the Internet it got more attention than usual. I’ve gotten arrested a lot, and what I’m used to is no attention at all! So the fact that there was a picture of me in the Washington Post was a first. Other people were struck by how little there was; if anything, I was struck by how much there was, because I have to tell you, protestors usually don’t get much attention. Thomason: Do you take your arrests as a badge of pride? 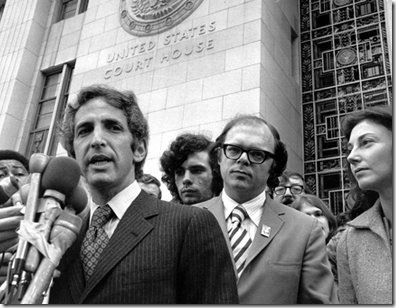 Ellsberg: Well, I think it was the right thing to do. I always enjoy being with the people who have decided to get arrested, many for the first time. I always find that they are people I like to talk to and be with and generally admire. So arrests have a very warm light for me because of the people involved. I think it’s something that citizens should regard as a part of their responsibilities part of the time, and that’s a small minority view, but I like being with the minority that feels that way. Thomason: Do you consider yourself a controversial figure? Ellsberg: That’s a fact. If controversy means varying views on me, and some very negative ones and some very positive ones, that’s the way it is.